Who wants to cook over a hot stove in the summer months? An Instant Pot is the perfect kitchen gadget to use for all your meals in the summertime because it cuts cooking time drastically and doesn't heat up your home. So not only do you save on your electric bill, but you can also spend less time in the kitchen and more time by the pool. What's a summer feast without messy, melt-in-your-mouth ribs? 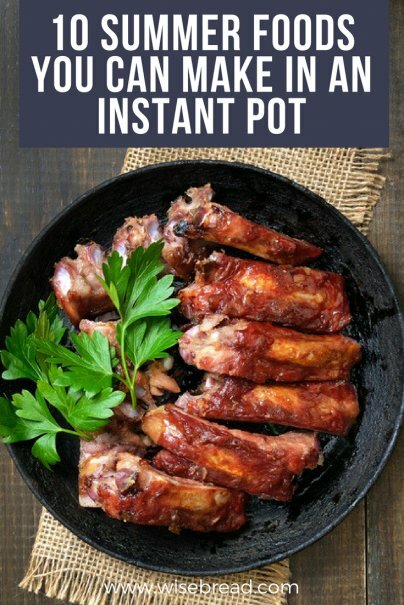 Cooking BBQ ribs in the Instant Pot keeps the meat from drying out and takes about 25 minutes to cook. Serve with corn on the cob and a lot of napkins. This potato salad recipe allows you to cook your potatoes and eggs together in the Instant Pot. No more boiling eggs and potatoes on the stovetop separately! It's seamless, effortless, and utterly delicious. And you can't have a summer cookout without the potato salad. If you can't make it to Hawaii this summer, then you can still enjoy a Hawaiian staple with very little prep work. Kalua pork tastes great on a bun, served over rice, or on top of a salad. This recipe makes quite a bit of meat, so you can enjoy leftovers for days to come. Summer months call for lighter breakfast fare. Yogurt is a great choice because it's packed with protein and calcium and can be whipped into a nutritious breakfast with the addition of granola and fruit. However, a quart of Greek yogurt from the store can cost over $4. For the cost of a gallon of milk and a small container of Greek yogurt, you can make three quarts of homemade yogurt at home that'll provide breakfast throughout the week. Ever have those moments when dinnertime is less than an hour away, and you haven't even thought about what you're going to serve? Forget making a fast food run, because this BBQ chicken is quick, tasty, and can be made with frozen chicken and sauces from the pantry. Plus, you can use BBQ chicken in sandwiches, burritos, on nachos, and more. When grocery stores start offering five for $1 deals on corn, fill up your cart and cook them in the Instant Pot. It takes three minutes to prep and cook corn on the cob in the IP, and you can cut the kernels off extra cobs for summer salads and side dishes. Meal planning can be challenging in the summer because most hot foods that take time to cook, like casseroles, don't sound appealing when temperatures go above 90 degrees. Luckily, these French dip sandwiches are quick to prepare. Serve with coleslaw or chips for a summer-worthy meal. To make life even easier, you can prep the raw meat with the seasonings and freeze for a quick Instant Pot dump meal on a busy night. If you can't imagine summer without a delicious piece of strawberry cobbler topped with vanilla ice cream, then you'll be excited to discover you can make this amazing dessert in your Instant Pot in under 30 minutes. If you love the way this recipe turns out, try replacing the strawberries for blueberries or blackberries. Forget the canned baked beans this summer and enjoy your cheeseburger with a side of homemade baked beans. The Instant Pot gives dried beans that cooked-for-hours taste in less than an hour. Serve at summer picnics or as an easy side with grilled meat.